The Nike Golf – N98 Track Jacket Style 483550 is available in Adult Sizes: XS-4XL and comes in Black, Navy/Gym Red and Varsity Royal/Black. Features of the N98 Track Jacket are that his jacket was originally designed for sport more than a decade ago, the N98 lives on in a sophisticated version that’s just as wearable off the course. Design details include flat knit collar, cuffs and waistband. Stripe and piping on the sleeves and front zippered pockets. A white Swoosh design trademark is embroidered on the right chest of Varsity Royal, White and Navy. A black Swoosh design trademark is embroidered on the right chest of Black. Made of 8.7-ounce, 53/47 poly/cotton double pique. The Nike Golf N98 Track Jacket is available for purchase in the following colors: Black, Navy/Gym Red and Varsity Royal/Black. This track jacket comes in adult sizes XL-4XL. 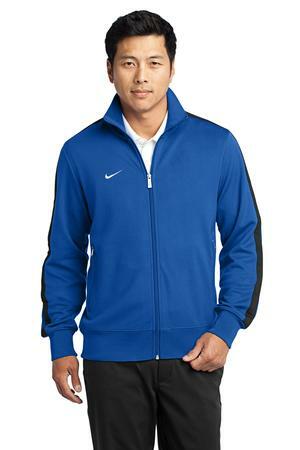 Be the first to review “Nike Golf – N98 Track Jacket Style 483550” Click here to cancel reply.